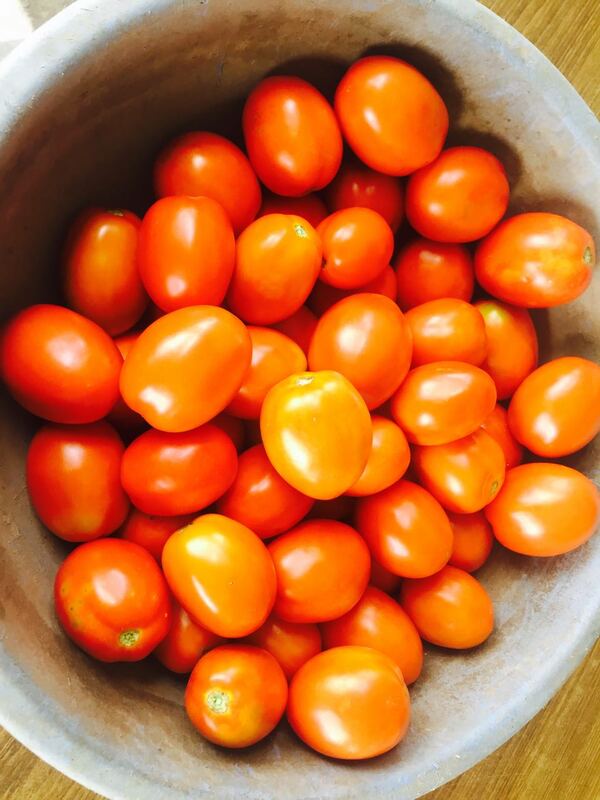 Capsicums are known to lower the fat stored in blood corpuscles, called triglycerides, and thus help in burning calories. This can vastly improve the body metabolism. 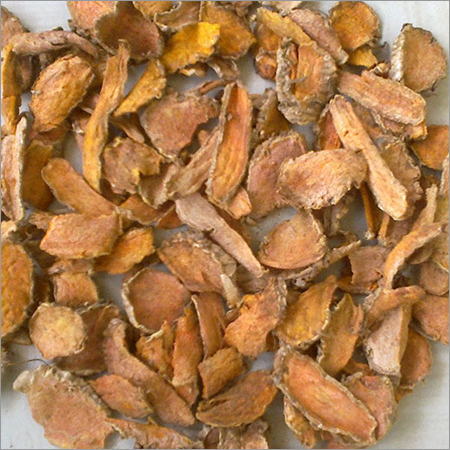 Moreover, this vegetable is considered beneficial in weight loss as it is low in fat and carbohydrates.It contains antioxidants like beta carotene (carotenoid), lutein and zeaxanthin (phytochemicals) and vitamin C. After consumption of capsicum, the body converts beta carotene into retinol, which is one of the most usable forms of vitamin A. These combine together and minimize damage caused by the free radicals to the tissues, arteries and nerves. Soil type Well drained fertile soils with a pH range of 6.0 to 7.0. Season of Transplanting June-July & Sept-Oct.
Nursery raising Pro-tray method: Trays filled with cocopeat and protected with nylon net house. Land preparation (main field) Raised bed method: 10-15cm height, 75cm width, convenient length, 45 cm inter-bed spacing. FYM application Apply 10 tonnes of enriched FYM. 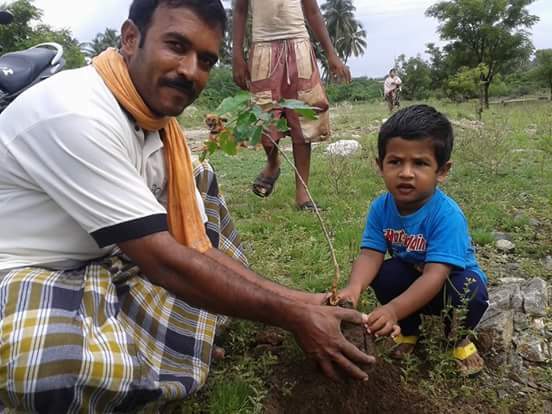 Neem cake application Apply neem cake @250kg. Basal fertilizer application Apply 15-15-12 kg NPK (60 kg CAN or 75 kg ammonium sulphate or 32 kg urea + 93 kg single super phosphate + 20 kg Muriate of potash). Mix well and level the beds properly. Laying of drip line Place one in-line drip lateral at the center of the bed for which 2670 meter length of lateral pipe is required. Spacing, plant population and transplanting Two crop row is maintained per bed of 90cm width. Spacing between the row in the bed is 60 cm. Make holes of 5cm diameter (7.5cm diameter if hot sunny day) at a distance of 45cm along the crop row. 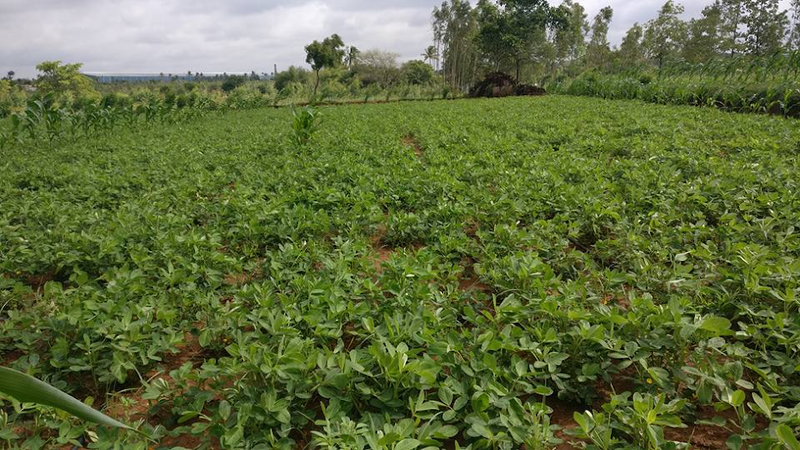 12000 seedlings can be accommodated in one acre. Transplant stocky 42 days old seedlings at the center of the hole. Avoid the seedlings touching the mulch film. Irrigation Run the drip irrigation daily for a duration of 20 to 40 minutes depending on the crop stage, season and emitter discharge. Fertigation Schedule fertigation once in 3 days starting from 21 days and ending at 129 days after transplanting for a 5 month duration crop, thus requiring 37 fertigations. 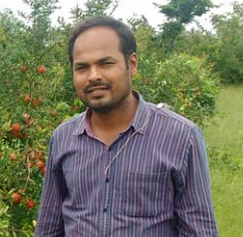 General recommendations: Apply one more dose of neem cake @100 kg per acre (containing 8-10 % oil) kept in the form of heaps (8-10 places) throughout the field at 30-40 days after transplanting. The adult and larval stages feed by piercing the plant surface with their mouthparts and sucking the contents of plant cells. 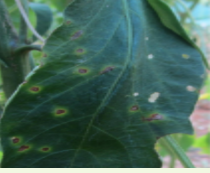 This causes white or brown spots on the leaves where the plant cells have been destroyed. spray half of the recommended dose of any insecticide mixed with pongamia oil (2 ml/l of water) + sticker (0.5 ml/l) + water and made into emulsion by shaking thoroughly . Downward curling and crinkling of leaves giving an inverted boat shaped appearance, elongation of Petiole i.e. rat tail symptom, stunted growth, on fruit scaring is very common with reduced fruit size. 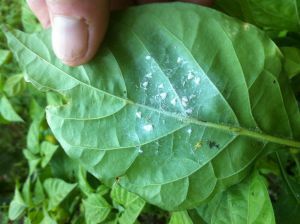 Aphids, mealybugs and scales are the most common sap sucking insects in the garden. 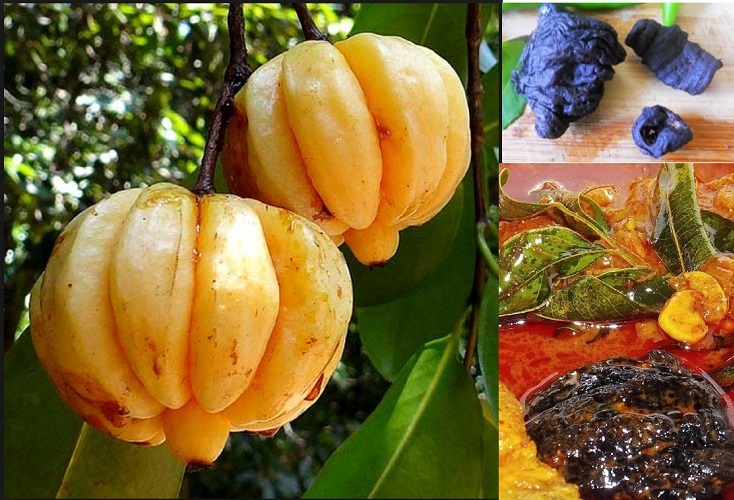 They appear on plant parts in clusters and feed on the sweet sap by inserting a needle-like sucking tube into the plant and drawing out the juice. After the sap has been used by the insects, it is excreted as honeydew, which forms the base on which a black fungus grows. This fungus is known as sooty mould and its presence reduces photosynthesis and discolours affected fruit. 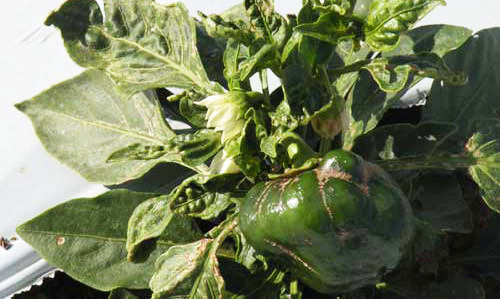 Aphids also act as vectors for transmitting mosaic virus disease. Honeydew is used as a food source by ants, which actively transport the insects (aphids, mealybugs and scales) and position them on the plant. Ants may spread sapsucker infestations between plants via underground tunnels. 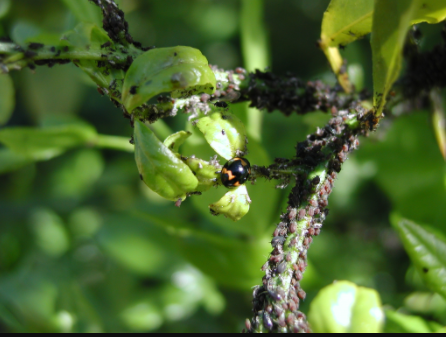 Aphids can be removed from plants with a jet of water or sprayed with garlic and chilli sprays. 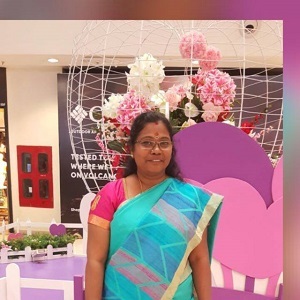 Sprays with horticultural soap will desiccate and suffocate the insects and horticultural oil will smother the insects but these organic products should not be used when the weather is above 32°C as plant leaves can burn. 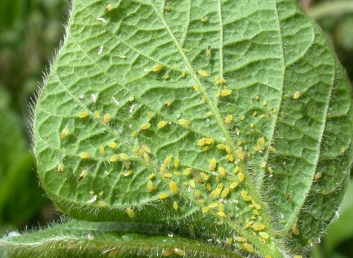 Aphids are especially attracted to mustard. 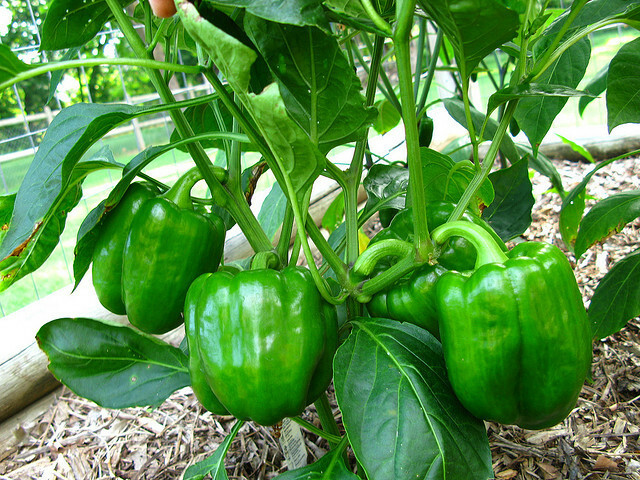 You can plant these near more valuable plants as traps for the aphids. Spray PNSPE (40 g/l) or Fipronil 5 sc (1.0 ml/l) or Quinalphos 25 EC (2.0 ml/l) or Oxydemeton-methyl 25 EC (2.0 ml/l). 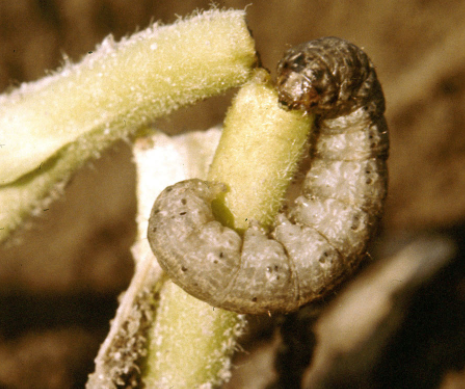 Young larvae feed on flower buds and young pod by making a circular hole. Later, the larvae feed on seeds. Spray specific NPV@ 100 LE/acre in the evening as soon as young caterpillars (egg masses in spodoptera) of the borers are noticed. Mix 1% jaggery and sticker (0.5 ml/L) before spray. 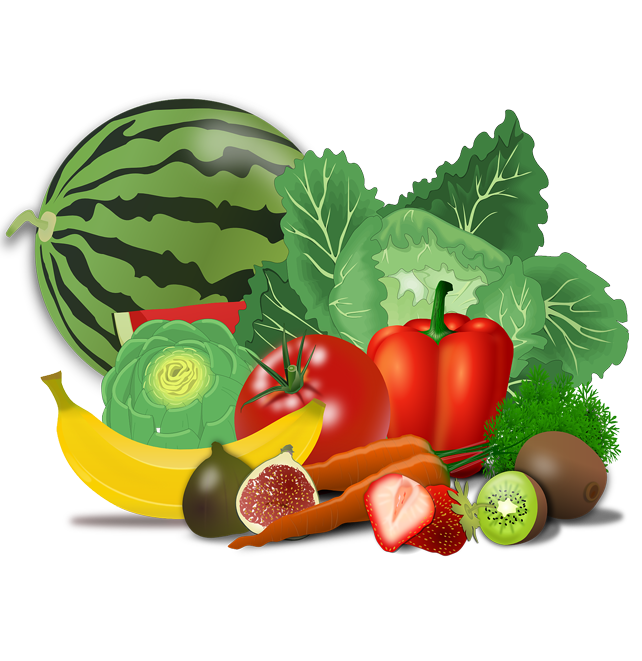 Collect and destroy the borer-infested fruits. 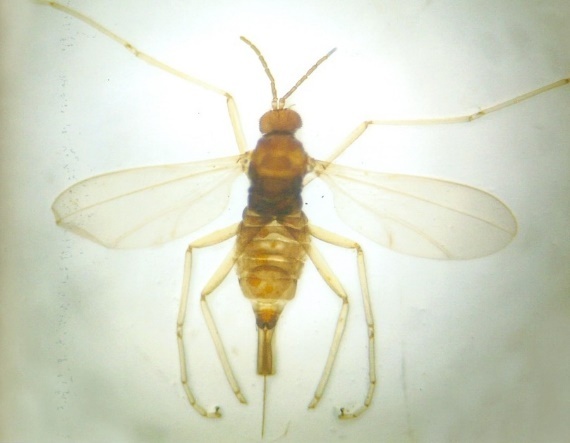 Note : NPV (Nucleopolyhedrovirus) belongs to a group of insect diseases called baculoviruses that infect and kill the larvae of moths and sawflies. 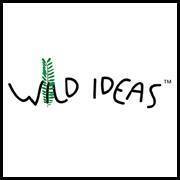 They do not harm humans, wildlife or other insects. NPV can kill young larvae within 4 days of ingestion, and older larvae within 5-7 days, depending on dose and temperature. Small holes on leaves. 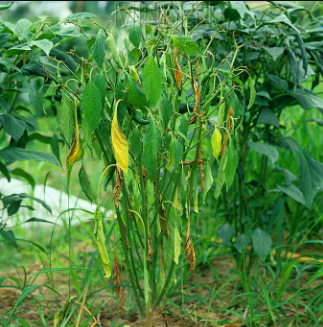 Skeletonized leaves and the affected pods drop off or develop white color on drying. (Egg masses and young caterpillars): Collect and destroy egg masses and gregarious larvae. Cutworms are the larvae of several species of night-flying moths. 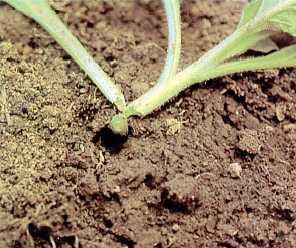 Cutworms feed at night and will not generally be observed on plants or on the soil surface during the day. Adopt poison baiting: Mix rice bran (10-12 kg/acre) with jaggery (gur) or molasses (2 kg) in the morning. Allow it to ferment till evening. 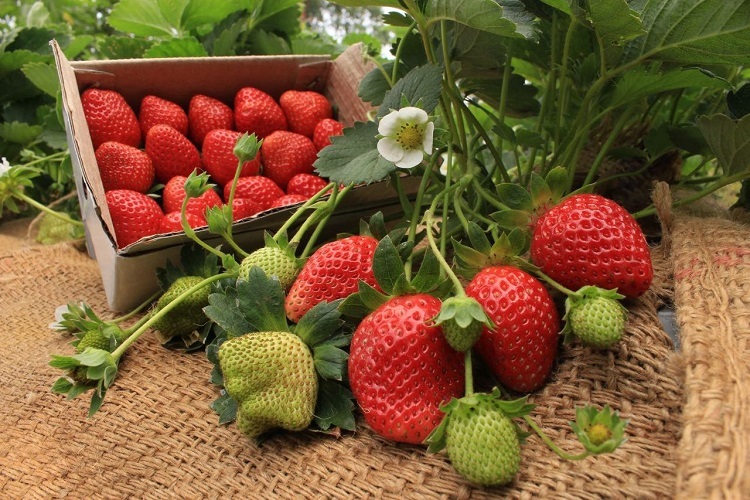 In the evening, mix this with an insecticide like methomyl or thiodicarb (250 g) and broadcast in main plot. Cutworms get attracted, feed on the fermented poison bait and get killed. Baiting has to be repeated 2 or 3 times more if the incidence of the cut worm or armyworm is high. Maggots feed on the ovary of the flower bud, flower and tender fruits. Affected bud remains unopened, while the affected flower dries and drops. Severe flower and fruit drop. 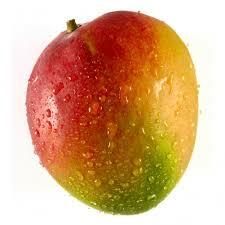 Affected fruits do not develop. 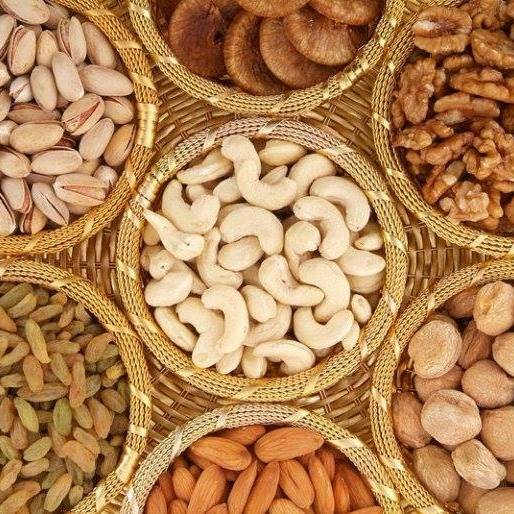 Reduction in yield, fruit size, seed number and production of malformed fruits. 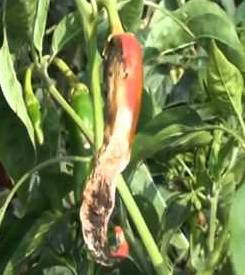 Seed may rot or the seedlings may be killed before they emerge from the soil. 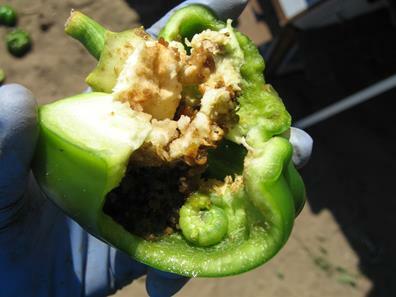 Stem of young seedlings may also be attacked after emergence showing water soaking lesions and shriveling of stem which fall over and die. Damping -off of seedlings: Drench seedlings with Captan 50 W (2.0 g/l) or Copper oxychloride 50 WP (2.0 g/l) or copper hydroxide (2.0 g/l) in nursery stage (15 days after sowing) and once before transplanting and once again two weeks after transplanting. Sometimes the powdery coating can also be seen on the upper surface. 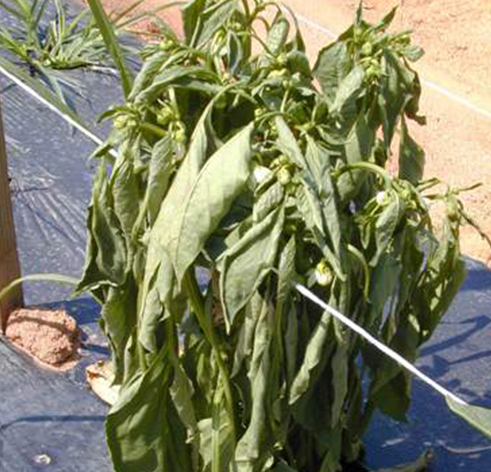 Severe infection results in the drying and shedding of affected leaves. Powdery growth can also be seen on young fruits, and branches. 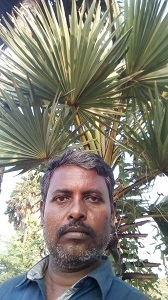 Diseased fruits do not grow further and may drop down. Spray Wettable Sulphur (3.0g/l) (before flowering only) or Tridemorph (1.0ml/l) or Hexaconazole (0.5ml/l) or Dinocap (1ml/l) or Flusilazole (0.3 ml/l) or Myclobutanil (1.0 g/l) or Neem oil emulsified (10-15ml/l) at 10-15 days interval from the onset of the disease. Caused by a water-borne fungus called Phytophthora capsici and is generally found in wet waterlogged areas. 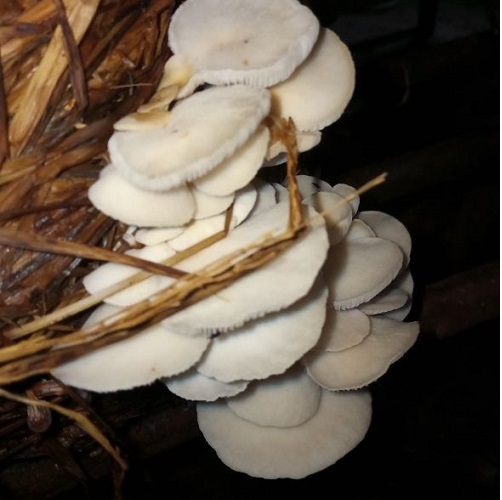 The fungus invades all plant parts causing the syndromes leaf blight, fruit rot and root rot. 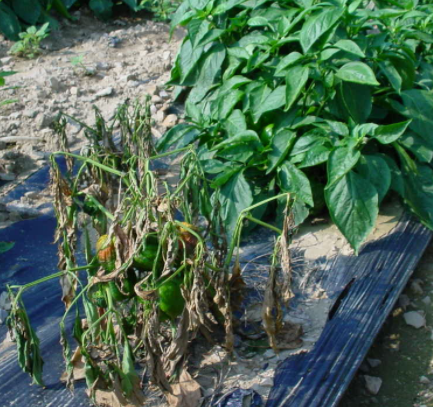 Plants suffering from this conditions often wilt and die very quickly. 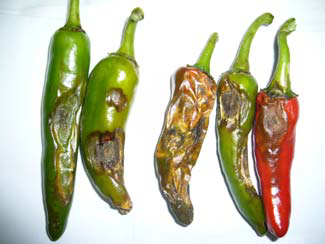 Anthracnose disease has been reported to be a major constraint in chilli production in tropical subtropical countries causing huge losses. 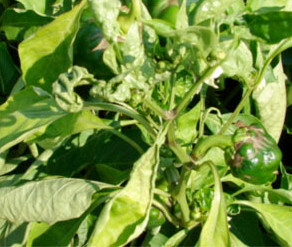 Symptoms are seen on leaf, stem and fruit. Small, circular spots on the skin of the fruit and expanded in the direction of long axis of the fruit. 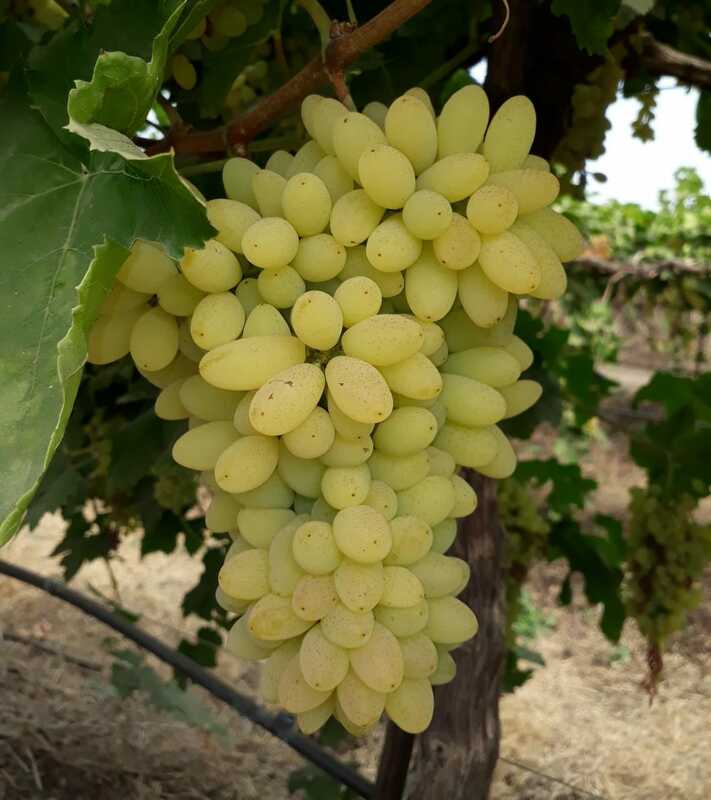 The fruits with many spots drop off prematurely resulting in heavy loss of yield. 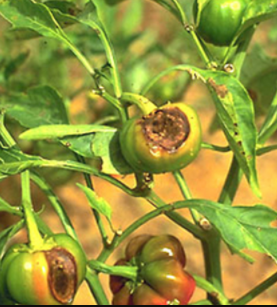 Fungus may also attack the fruit stalk and spread along the stem causing dieback symptoms. Spray Carbendizim (1.0g/l) or Thiophanate methyl (1.0g/l) or Tricyclozole (0.6g/l) or comination of Tricyclozole +Mancozeb (2.0 g/l). 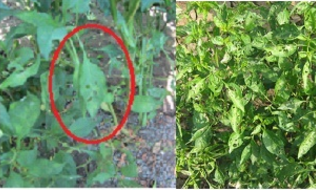 The leaf spot disease is seen both in nursery and main field. 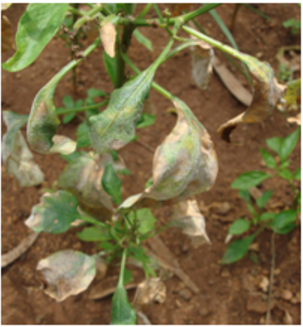 The disease causes loss due to defoliation and reduction in photosynthesis. 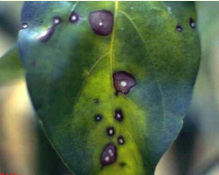 The disease first manifests as small brownish spots on the leaves and graduallydevelops into the big circular grayish spots with whitish center. Later they form into large lesions due to coalescing of the spots. Infection on fruit stalk and calyx is also very common in severe cases. Spray Carbendizim (1.0g/l) or Mancozeb (2.0g/l) or combination of Carbendazim+ Mancozeb (2.0g/l). Drench seedlings with Copper oxychloride (3.0 g/l) 12days after sowing and repeat one day before transplanting. 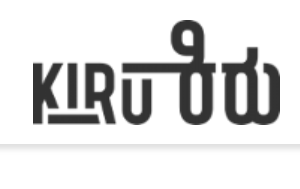 Spray Copper oxychloride (3.0 g/l) or Chlorothalonil (2.0g/l) or Mancozeb (2.0 g/l) or Propineb (2.0 g/l) or Metiram (2.0 g/l) or Pyraclostrobin + Metiram (2.0g/l) or Tebuconazole + Trifloxystrobin 75 WG (0.7 g/l) at 10-15 days interval or as and when required. 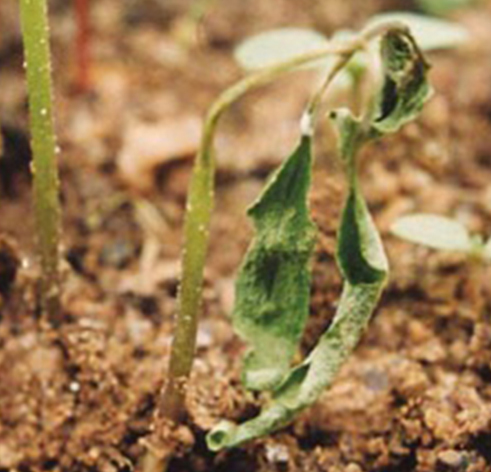 The first symptoms start with the wilting of the leaves. After a few days the entire plant will wilt with no leaf yellowing. 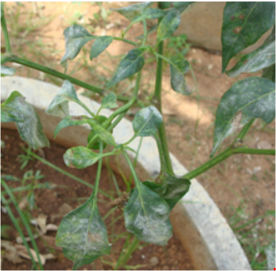 Leaf curl disease is transmitted by white flies ( Bemisia tabaci). 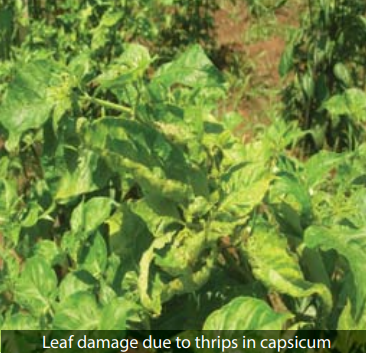 The disease is characterised by puckering of leaf blade, and gradual reduction in the size. 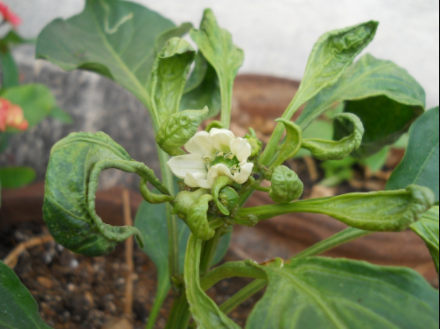 Diseased plants flower poorly with low fruit set.In case of leaf curl the disease is characterised by curling of the leaves, and thickening and swelling of veins. 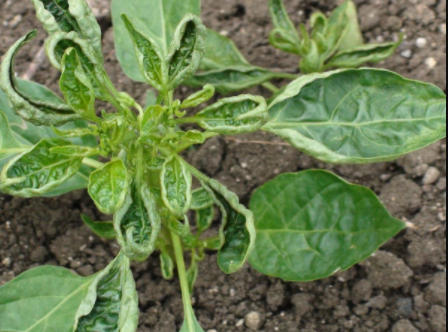 In advanced stages the whole plant appears bushy, with stunted growth and fewer flowers. Uproot and destroy the leaf curl infected plants up to first harvest. 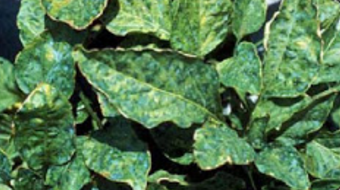 Leaves of infected plants show dark-green mottles, with dark-green spotting, patching and banding adjacent to the veins. 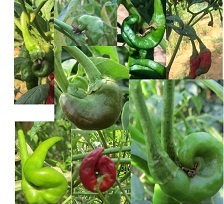 These viruses are transmitted by aphids. Uproot and destroy the infected plants up to first harvest. Harvesting and yield: Harvesting begins 60 days after transplanting. Yield: 20 tonnes. Well decomposed Farm yard manure (one tonne) is thoroughly mixed Azotobacteror Azospirillum, Phosphate Solubilizing bacteria (PSB), Trichodermaharzianum or Trichodermaviridae, Pseudomonas fluorescens, Bacillus subtilis, Paecilomyceslilacinus or Pochoniachlamydosporia each @ 1 kg. This is then moistened by sprinkling water and covered with wet gunny cloth kept to incubate for about 3- 4 weeks (15-20 days). For better aeration and decomposition it is advised to give a turn in between at around 10-12 days. This enriched FYM should be mixed with remaining nine tonnes of FYM before applying to the main field. Powdered neem cake (100 kg) with oil content (>10 %) is thoroughly mixed Azotobacteror Azospirillum Phosphate Solubilizing bacteria (PSB), Trichodermaharzianum or Trichodermaviridae, Pseudomonas fluorescens, Bacillus subtilis, Paecilomyceslilacinus or Pochoniachlamydosporia each @ 1 kg. This is then moistened by sprinkling water and covered with wet gunny cloth kept to incubate for about 10 days. If it is to be stored for a few more days, for better aeration and decomposition it is advised to give a turn. This enriched neem cake should be applied to the main field along with farm yard manure application at the time of bed preparation for planting. This enrichment is required, if enriched FYM was not used/applied. 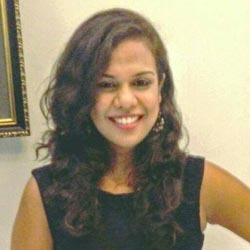 ***Poison baiting: Mix rice bran (10-12 kg/acre) with jaggery (gur) or molasses (2 kg) in the morning. Allow it to ferment till evening. 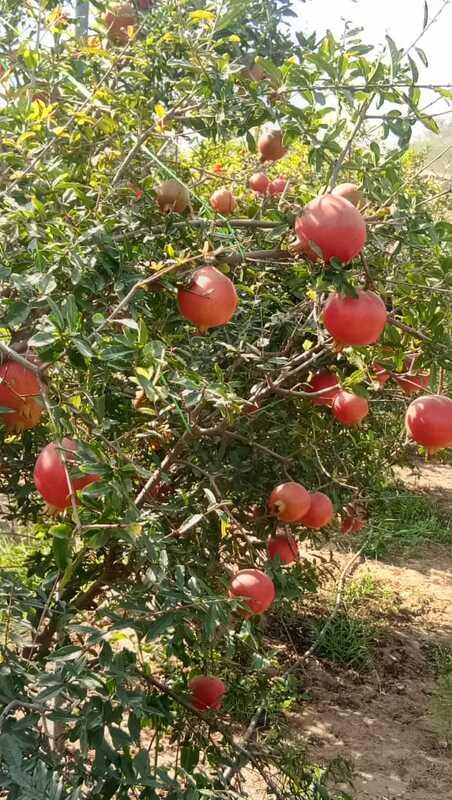 In the evening, mix this with an insecticide like methomyl or thiodicarb (250 g) and broadcast in main plot. Cutworms get attracted, feed on the fermented poison bait and get killed. 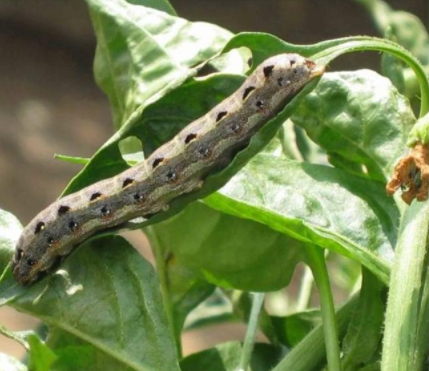 Baiting has to be repeated 2 or 3 times more if the incidence of the cut worm or armyworm is high. Baking soda spray: Baking soda is a white soluble compound that has fungicidal properties when used as spray on diseased plants. 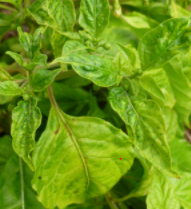 It also serves as protectant (on plants) from disease-causing pathogens. Mix 1 tbsp of baking soda and 1 tbsp of dormant oil or vegetable oil. Add 4 liters of water and stir well. Add one tbsp of dish washing liquid soap and stir it again. Fill-in water can or sprinkler and spray. Stir or shake the container from time to time to prevent soda from separating. Repeat application every after 2 weeks. Apply baking soda spray as soon as the symptoms appear. Be sure to include the undersides of the plants’ foliage. Spray in the early morning or late afternoon. Bordeaux mix: There are many copper compounds that are used as fungicides. The most common is Bordeaux mix which is a combination of copper sulphate and hydrated lime. Copper sulphate, lime and water in the ratio 1:1:100 are used for preparing one per cent Bordeaux mixture. In order to prepare 100 Litres of mixture one kg of copper sulphate is dissolved in 50 Litres water. In another vessel one kg of fresh quick lime is slaked by sprinkling water and the volume of lime solution is made up to 50 Litres water. The copper sulphate solution is poured into lime solution by stirring the mixture. 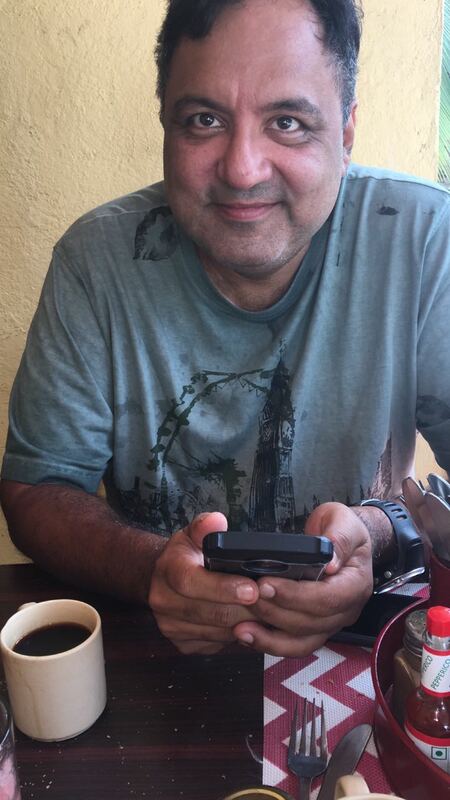 Both solutions can also be poured into a third vessel with constant stirring. The prepared Bordeaux mixture should be strained through a cloth/strainer before spraying. Spray plants thoroughly preferably early in the morning, in a dry and sunny day. In this way, the plants have the time to dry and the solution can not penetrate into the leaves’ tissues. Constantly shake the sprayer while in the process of application to prevent the solution from clogging. 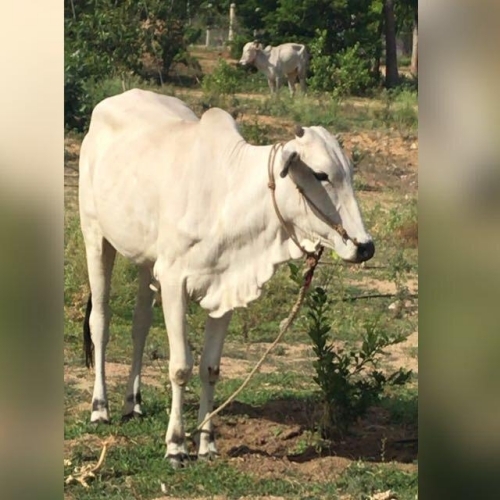 Cattle-dung and Urine Extract: Mix Cattle-dung (5 kg) and urine (5 liters) thoroughly in 5 liters of water in a container and allow this mixture for 4 days by keeping a lid over the container. After 4 days, filter and add 100 grams of lime to this solution. Dilute the solution in 80 liters of water, which is sufficient for spraying an acre. Spraying cow dung urine solution prevents eggs laying by the moth, e.g. Helivoerpa and Spodoptera, etc. It is found to give protection against some diseases and the sprayed crop looks green and healthy. Tobacco Decoction: Boil 1 kg tobacco dust in 10 liters of water for 30 minutes to attain coffee red colour. Add water to the boiling solution to make 10 litres volume. Cool and filter the decoction using a thin muslin cloth. Add soap @ 2 g/l and dilute to 80 to 100 litres for spray. This preparation is effective against whitefly, aphids, and leafhoppers. 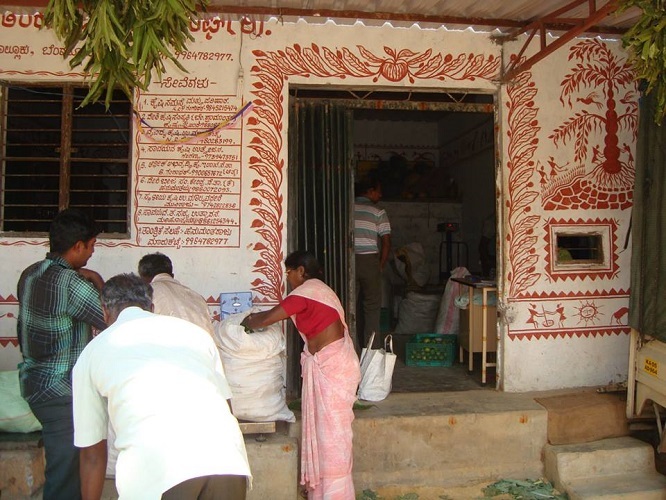 Tobacco decoction should not be used frequently as it is toxic to natural enemies. Precision agriculture, as the name implies, means application of precise and correct amount of inputs like water, fertilizer, pesticides etc. 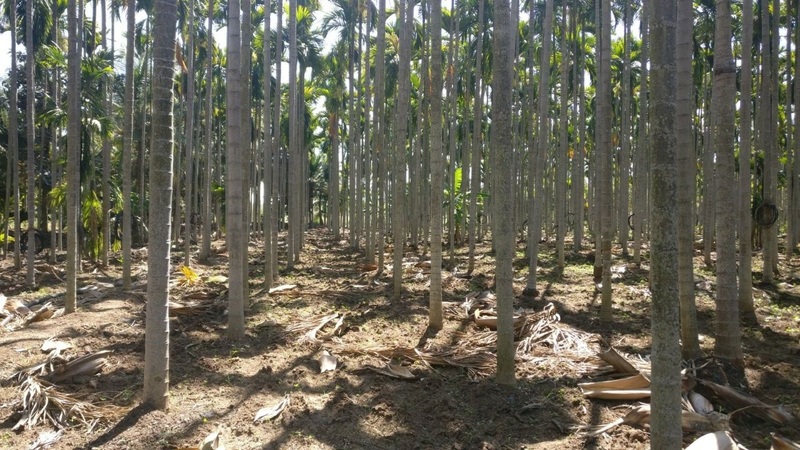 at the correct time to the crop for increasing its productivity and maximizing its yields. Precision agriculture management practices can significantly reduce the amount of nutrient and other crop inputs used while boosting yields. Farmers thus obtain a return on their investment by saving on water, pesticide, and fertilizer costs. 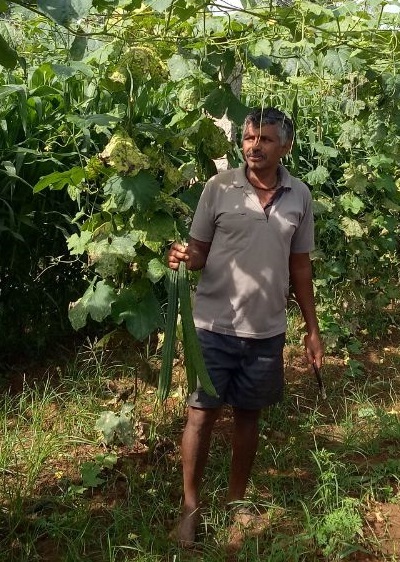 Applying the right amount of inputs in the right place and at the right time benefits crops, soils and groundwater, and thus the entire crop cycle. Consequently, precision agriculture has become a cornerstone of sustainable agriculture, since it respects crops, soils and farmers.